The research related to educational interventions for children with mathematical learning difficulties has been increasing steadily. 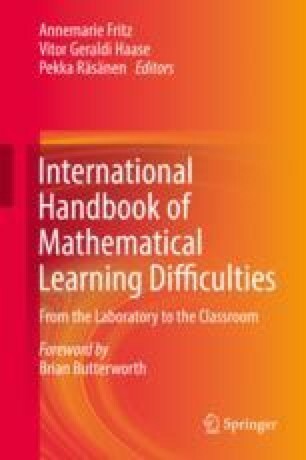 In this chapter I focus on small group interventions for children aged 5–9 years old with learning difficulties in mathematics. First, I describe the important issues: (1) who are the children having problems in mathematics, (2) what do we mean with (special) education intervention, (3) what does Responsiveness to Intervention mean, and (4) what intervention features have been found effective for children aged 5–9 years with learning difficulties in mathematics. Then, I describe the research and developmental work that has been done in Finland on designing web services which provide evidence-based information and materials for educators. The two web services are LukiMat and ThinkMath. Together, these two web services include the knowledge base, assessment batteries and intervention tools to be used in relation to mathematical learning difficulties in the age group 5–9 years. Ansari, D. (2015). No more math wars – an evidence-based, developmental perspective on math education. Education Canada, Retrieved from www.cea-ace.ca.